The Story of "Polly Moo Moo"
When Cissie Roth came to the office late in the fall, we had just owned the Big Rock House (now Home Coming) a little while and the inescapable truth was that my dear sweet Mother was terminally ill. I said “no” to her bluntly and strongly: “I could not help with Christmas in Downtown Elkin!” Although, Christmas was so special to Sam and me, I have been in the Elkin-Jonesville Christmas Parade every year of my entire life up this point; my answer was still a resounding “NO!” As Cissie turned to go I felt my heart hit the floor and my inner child grabbed me and went running. My heart leaped from my body screaming ”YES!” Most of the rest I’ll save for another tale. I have always loved animals. In addition to the Parade, full-blown music and the lighting of Downtown, we had a petting manger. Pooling my resources, I called every fellow animal lover, from clients to friends, and fellow Elkin lovers. It is important to state that a lot of true Elkin lovers are not from Elkin, which could make yet another tale. We recruited sheep, goats, and a donkey, of course, but the star of the show was Polly, a day-old calf no bigger than a German Sheppard that was donated by Myers Dairy. Katie bar the door! Deborah and Sam were instantly a cow’s parents! Sam and I had no real experience in raising a calf. There I stood in my red velvet Christmas frock and Sam in a beautiful Norman Stockton suit. Sam is now frantically calling Tractor Supply for a bottle and milk and I am on the phone with Vet Roger Holt getting debriefed on bringing up a baby calf. Polly was glowing with her head in my lap! We made the trip to Yadkin County that chilly winter night and introduced Polly to her new brothers Noah and Moses. We had an excellent kennel that my sweet Daddy built for me just after Sam and I had gotten married generations of St. Bernard’s ago. Moses bunked in with Noah and Sister Polly had moved comfortably into the dog kennel. The Boys (Noah and Moses) were delighted! Polly was never shy. She was a big eater, slurping her bottle down so fast that the St. Bernards, Sam and I were all truly amazed. After a bottle, it was time to cuddle and bond. Sam and I and the Boys (Noah and Moses) swooned over her. Polly particularly liked sucking my thumb! Soon Polly bloomed and grew! Her sides began to scrub the sides of the kennel run door and she was on meal (cow food) along with her bottle. Soon we had to move her outside to a large graveled dog run. My Daddy once again came to the rescue, as he and Sam opened a dog run into a small pasture and constructed a manger for Polly. She loved her cow food and picking through the spring grass in her private meadow. As she grew, we noticed these huge bumps on Polly’s head. It started to hurt when she would rub her head up against us. A call to Dr. Holt confirmed those were horn buds and they were growing fast! When Roger came over to dehorn Polly, I was out showing Real estate and Sam was at home. The two confirmed that they would bandage her head to keep me from panicking. A few days later the bandages came off and Polly was even more beautiful than ever! My Mother loved Polly Moo Moo so much. She could see her in the meadow and we would walk her over to visit. Never a big talker, at about 6 months old she uttered her first words. Moo! Moo! Moo! With a sound that was remarkable—so much like the St. Bernard’s!! We also noticed that she was wagging her tail back and forth chasing the boys’ (Noah and Moses) basketball around her meadow. She was always so happy and when really excited she would do a major cow dance. My Daddy, Polly’s Papa, was always bringing her cow goodies and special treats for the boys (Noah and Moses) and the barn cats. He was devoted to Polly and Noah and Moses and kind to the stray barn cats….. They were his grandbabies and they all loved him dearly. At about the same time Sam and I determined that the only thing we needed complete her cow ensemble was a big pretty bell for her to wear around her neck. Sam and I, the proud parents that we were, bought a special red halter for Polly and a beautiful bell. Sam placed the bell gently around Polly’s neck; we took a step back to admire our beautiful Polly and her new attire. It was everything we had worked and searched for. Polly looked Cowfantastic. She took a step and the bell rang out. At that moment Polly let us know that cow dress up time was over and she took off through the pasture jumping and dancing in protest. It was a 10 minute tirade of jumping and kicking. Sam and I were like two deer in the headlights we could not move… our mouths were on the ground. Polly is now exhausted and her electric fence is on the ground like sewing thread. Our gorgeous girl walked up and said: “My bell is beautiful, thank you, but no!” The bell was hastily removed and hung on the fence where for the remaining years Polly would politely walk up and ring it when she wanted anything. When my father fell in 2007, we learned how much Daddy loved us all. Polly and the boys watched everyday at the fence for him to come on the tractor with their goodies. Noah and Moses’ cat that had kittens in the dog house with them had just weened her litter and the boys moved from their front porch back to their beds and the kittens were content in making biscuits in the long luxurious St. Bernard fur. When Papa became ill Polly and the boys watched dutifully at their fences for Papa….any sound or movement of his shop door or the tractor brought them all to attention in hopes of seeing him one more time. Then in their 12th year Noah and Moses fell ill and died within six months of each other. Polly was broken-hearted. It was a hard time for all of us who remained. The cat moved in with Polly in her manger. When that year’s litter came, Polly was overjoyed and the kittens made their biscuits in a new kind of fur. It was then we learned of a special talent the boys had taught her. Polly was undisputedly the best security system we have ever encountered. The rich deep mooing when anything was out of place was better than any alarm and she was very courteous with her inquires of a stranger. There is a great quietness around sickness and death. It is made up of love, duty, responsibility, hope and peace. Pain can not overcome the joy that lives in our souls. Polly was a great help and comfort to Sam and me. Steady and true, she was always a kind and loving humble lady. She only got out of her pasture once and agreeably returned when she was instructed. She loved Roger Holt and was determined to lick him from head to toe. Roger loved Polly and established the fact that, at approximately 1,500 pounds, she was the finest Holstein in Yadkin County. She had a presence about her that just glowed of happiness and love. She had a special ability to make you recognize good and to give joy. One of the songs from our wedding rings so true: “Sunrise, Sunset, Swiftly Fly the Years...” When I was young child in church at revival the sermon was about the rapture of the Church. I was saved when I was seven years old. I cried during the sermon and after church the preacher came up to me and asked me what was wrong. I explained to him that I would be so happy to see Jesus but my dogs would starve to death without food or water. The preacher opened his Bible to the book of Genesis 1:26 “And God said, Let us make man in our image, after our likeness: and let them have dominion over the fish of the sea, and over the fowl of the air, and over the cattle, and over all the earth, and over every creeping thing that creepeth upon the earth.” That showed me where we (people) have authority over the animals. He said that if I was alive when the rapture came just to call them and they would come, too. I asked him what would happen if they die first. He said to give them to Jesus and they will meet you in Heaven. Sam and I have dedicated everything we have to the Lord and each other from the very beginning. When I first saw Sam, I knew he was my husband. Before he said hello to me I had already whispered a silent prayer and thanked God for him. You see, we are not owners of anything but stewards giving care to all God’s things He allows us to enjoy. 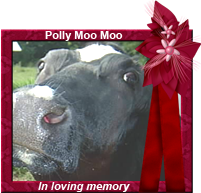 Polly the Jesus’ Cow traveled on to be with loved ones in Heaven on July 2, 2011. She was born to Myers Dairy and the Star of the petting manger at Christmas in Downtown Elkin. Polly lived a full and happy life and she proceeded in death by brothers Noah and Moses, and Grandmother Jerry E. Reece. Polly is survived by Loving Parents Sam and Deborah Swift, Her Loving Papa Max W. Reece and Grandmother Hazel J. Hemric. Sam and Deborah Swift would like to express their gratitude to Dr. Roger Holt, Dr. Christopher Eads, Felix and Patricia Hobson. Special Thanks to Sturdy and True Friend /Cow Consultant Walter Shore, Cissie Roth and Myers Dairy. Praise to Jesus who makes great joy possible. You can visit Polly online at www.Swiftrealtors.com and www.Homecominghouse.com.